In 2006 according to the USDA, 70% of the nation's head lettuce was produced in California. In 2000, 73% of all the lettuce grown in the U.S. was iceberg lettuce. Lettuce (of all types) is the second most popular fresh vegetable in the United States behind #1 potatoes. The average American eats approximately 30 pounds of lettuce each year, which is five times what was eaten in 1900. Iceberg lettuce takes about 85 days from sowing to maturity. Leaf lettuces average 45 to 50 days from sowing to maturity. Darker Green lettuce leaves are more nutritious than lighter green leaves. Lettuce is a vegetable that is pretty much immune to any form of preservation. You can't freeze it, can it, dry it, or pickle it. While accumulating a worldwide gene pool of lettuces, the USDA found red, yellow varieties, and blue-green varieties of lettuce. The expression 'rabbit food' refering to lettuce, was first recorded in the 1930s. The ancient Greeks believed that lettuce induced sleep, so they served it at the end of the meal. The Romans continued the custom. However, the dictatorial Emperor Domitian (81-96 AD) served it at the beginning of his feasts, so he could torture his guests by forcing them to stay awake in the presence of the Emperor. The lettuce that we see today, actually started out as a weed around the Mediterranean basin. Served in dishes for more than 4500 years, lettuce has certainly made its mark in history with tomb painting in Egypt and identification of different types of lettuces by various Greek scholars. Christopher Columbus introduced lettuce to the new world and from there, lettuce in the United States began cultivating. Lettuce was introduced to the New World from Europe, as early as 1494. Thomas Jefferson had 19 varieties of lettuce growing in his garden at Monticello. BUTTERHEAD (includes Boston and Bibb) - Loose heads, grassy green leaves, butter texture, mild flavor. Good examples are Boston lettuce, which looks like a blooming rose, and Bibb lettuce that has a small cup-shaped appearance. CRISPHEAD - The least nutritious of the salad greens, this pale green lettuce takes on the cabbage appearance with its leaves more tightly packed together. An example is the Iceberg lettuce. It’s known for the crispy texture and very mild flavor. LOOSELEAF - This variety doesn’t grow to form lettuce heads, but is instead the leaves are joined at the stem. Good examples of this variety include: oak leaf, red leaf, and green leaf. ROMAINE OR COS - This lettuce has gained tremendous popularity in the past decade as the key ingredient in Caesar salads. It has a loaf-like shape with darker outer leaves. 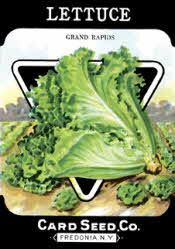 It’s strong taste and crispy texture has been favored by those who like Iceberg lettuce.